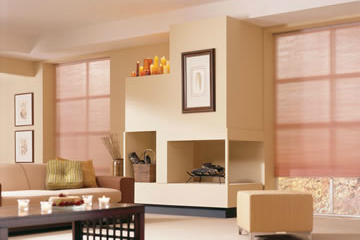 Honeycomb cell shades at Houston Blinds For Less are one of the leading energy efficient window coverings available. Also called cellular shades, honeycomb shades and blinds are extremely popular due to their sleek, crisp style and versatility. Honeycomb cell shades are known for their beehive-like design. These high-quality, accordion-style window shades are a great source of insulation due to their double-pleated layer with an air pocket in between. This type of insulated design is a heat trap for sunlight, allowing the room to be maintained at a cooler temperature. Closed honeycomb cell shades create a barrier of air between the window and room, which allows you to save on heating costs in winter and cooling costs in the summer. You will find a wide selection of honeycomb cell shades at Houston Blinds For Less to enhance your room décor. We offer an array of fabric styles in various colors and textures to compliment any type of window. Honeycomb cell shades are also available in light-filtering and room-darkening versions. Light filtering honeycomb shades maintain superior energy efficiency while still allowing light to fill the room. 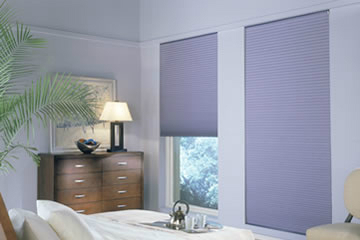 Room darkening cellular shades are the perfect window covering if you want to block out all sunlight and make your space more private. 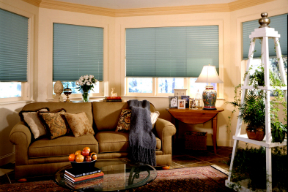 Houston Blinds For Less also offers pleated shades that are an affordable and durable option for rooms where dim lighting is preferred. Houston Blinds For Less also offers several options that will enhance the usability of your honeycomb cell shades, including cordless, top down/bottom up, continuous loop system and motorized operation. Cordless shades are safer for homes with children and a continuous loop system makes raising larger, heavy shades much easier. With the top down/bottom up feature, you can raise the shade to the top of the window or lower it to the window sill. Let sunlight shine in above the shade while enjoying the privacy of a closed shade at the bottom. If you want to automate your shades or control them with a remote, consider the motorized operation option. With motorized operation, you can effortlessly raise or lower one or more shades with a wireless remote or timer control. Some shades can be controlled with your mobile device. Inquire about your options for motorized honeycomb shades. Honeycomb cellular shades at Houston Blinds For Less are also available in various cell sizes: ¾-inch, 3/8-inch, ½-inch, 1-inch and 5/16-inch. Houston Blinds For Less welcomes the opportunity to show you our products, answer your questions and help you select the best honeycomb cell shades for your home or office. We cater to the entire Houston area, including Cypress, Katy, Sugarland, Baytown, Galveston, The Woodlands, West U and other surrounding cities and communities. Call (281) 997-2100 or contact us now to schedule a free consultation or visit our showroom in Pearland.